Lazy, haphazard comedy tries to combine stoner movie with Christmas. If you’re already snickering at that idea then you might find this amusing. Everyone else would be wise to skip this lump of coal. Still curious? Well, here’s the “plot”. 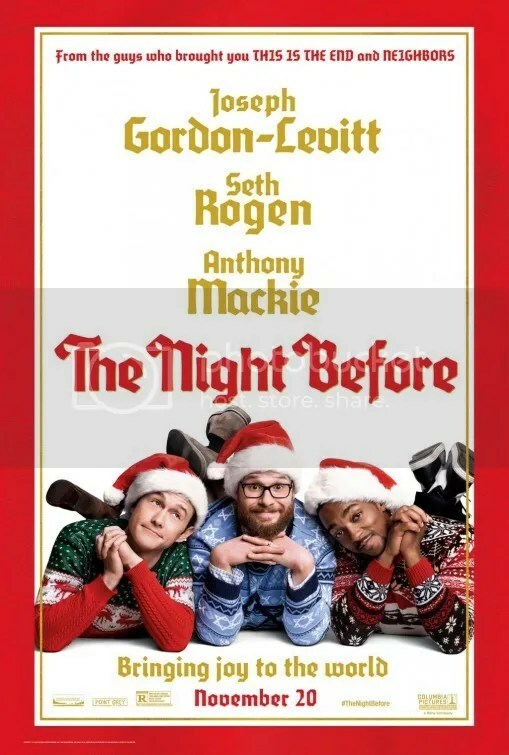 Every year Isaac (Seth Rogen) and Chris (Anthony Mackie) have taken their best buddy, Ethan (Joseph Gordon-Levitt), out on Christmas Eve for a wacky night of carousing. The three have been friends since childhood and this has become an annual tradition. You see back in 2001 Ethan lost his parents in a car accident on this very night. The Night Before basically answers a question no decent person would ask, why honor your loved ones by visiting their final resting place, when you can engage in a night of debauchery instead? The “Holy Grail” in their life is the Nutcracker Ball a wildly outrageous but highly exclusive party they’ve always heard about, but never been to. While working as a coat check “elf” for a hotel, Ethan finds three tickets to said blowout in the pocket of someone else’s jacket. He promptly steals them and then he’s off to round up his friends. Before they go out, Ethan gives them festive sweaters to wear because er uh I guess someone in wardrobe thought ugly knit pullovers were hilarious. Anyway, the location of the bash won’t be announced until 10pm so that means they have got some time to kill. Buckle up for a series of scattershot gags and misfires. I know it’s stupid to try and find reason in a stoner comedy, but at least the setup in the best of them (Friday, Harold & Kumar Go to White Castle) is rooted in some sense. Why Chris, who is now a famous football player, would still have nothing better to do than hang around these preternatural adolescents, is an enigma shrouded in mystery. Another befuddlement: why would Isaac’s wife Betsy (Jillian Bell), who is ready to give birth to their first child at any minute, give her husband a Whitman’s sampler of recreational drugs, then send him out for the evening, while she hosts her own holiday soiree without him, on Christmas Eve no less?! Oh wait, was the screenwriter on drugs? Perhaps the viewer is supposed to be. It is one night in the life of 3 men in a perpetual state of adolescence. The feeble set-up keeps promising that something TOTALLY UH-MAZE-ZING is going to happen. It never does. (Unless watching Miley Cyrus lip sync “Wrecking Ball” is your idea of the most awesomest thing ever.) They play a giant toy piano at FAO Schwartz à la the movie Big, sing “Christmas in Hollis” in karaoke bar, hang out with Ethan’s ex-girlfriend Diana (Lizzy Caplan), then irritate her best friend Sarah (Mindy Kaling). A major plot development happens when Isaac receives some racy texts after he accidentally takes Sarah’s phone. Isaac is perpetually under the influence of drugs which means he’s unhinged the entire time. Michael Shannon pops up occasionally as their disturbingly peculiar pot dealer. He’s kind of a welcome presence actually. None of the three dudes’ adventures are even remotely funny. That is until about halfway through when Isaac winds up in a Catholic church wearing his blue Hanukkah sweater. Isaac is still tripping out and he’s feeling a bit self-conscious. Then he hallucinates a baby is cursing at him. I laughed then and I think I chuckled again somewhere before the end. 2 stars, one for each guffaw. It’s Christmas Eve, 1944. Two entertainers in the army are giving a show to the troops of the 151st Division somewhere in Europe. In the midst of the program, an enemy attack causes a large stone wall to fall toward Bob Wallace. Phil Davis is able to push him out of harm’s way, but not without sustaining a minor injury to his own arm. After the war, Phil uses his good deed to convince Bob to form a singing duo. They make it big in nightclubs, radio and then Broadway where they launch a hit musical. Bing Crosby and Danny Kaye are the army buddies, Rosemary Clooney (George’s aunt) and Vera-Ellen are the sisters they hire into the act. Everyone has chemistry to spare. White Christmas is a perennial favorite of the holidays. Of course the title for the movie is from the enduring hit, the best-selling single of all time. 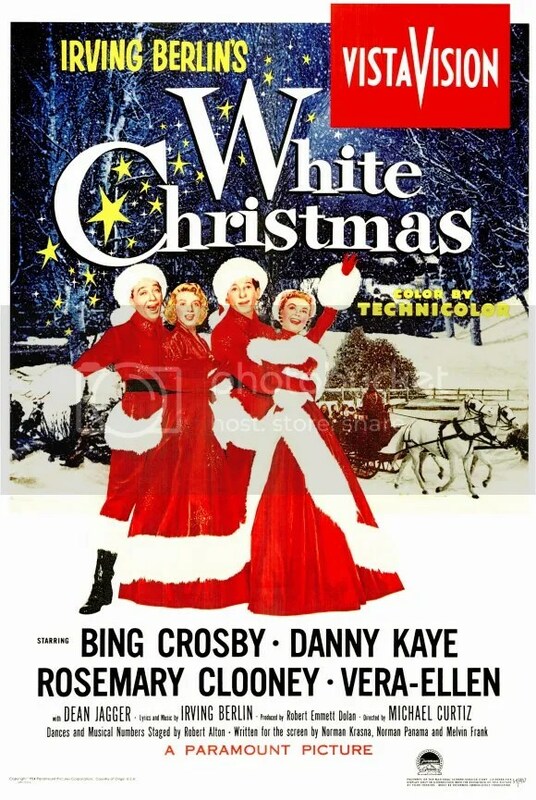 Originally written for the 1942 musical Holiday Inn, White Christmas was a belated follow up to that hit movie. This is another excuse to weave a lot of Irving Berlin songs into a simplistic plot. “Blue Skies”, “Snow”, “Love, You Didn’t Do Right By Me.” They’re all here. The song “Sisters” is particularly entertaining – in 2 different versions sung by both sexes. Bright colorful production is beautifully filmed in the widescreen format VistaVision. White Christmas also spotlights some really splashy dance numbers including “Choreography”, “Abraham” and “Mandy”. The latter of which features dresses and tuxes in such blazing reds and greens, the color is simply bursting from the frame. The spectacle was syrupy sweet when it came out, but feels even more corny today. A less secure critic might be embarrassed to concede that he actually delights in this sort of hokum. I freely admit I enjoy this film without one iota of shame. There’s a sugar-coated artificiality to the proceedings, but that’s what makes the old fashioned display so heartwarming. There’s a reason why this has endured for 6 decades. KEY: I am using (!) to indicate surprise, shock or being mentally baffled ; a WTF moment. When a Christmas gift – a bike – accidentally goes undelivered to a little girl, Santa’s son Arthur takes the initiative to solve the problem. 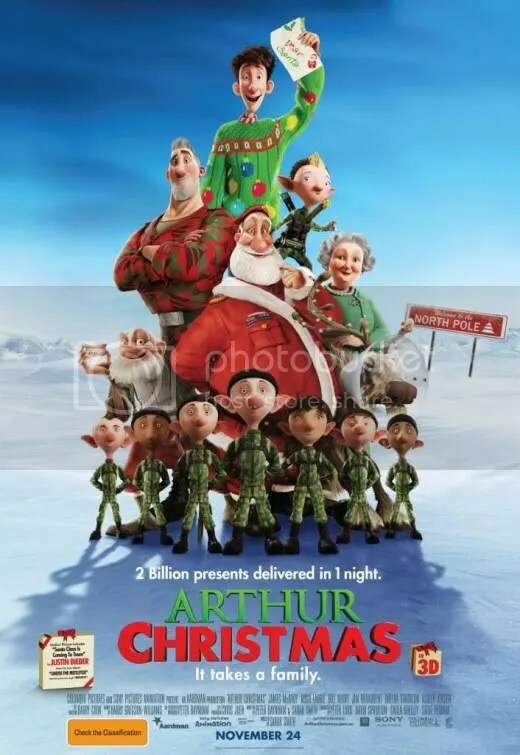 Arthur Christmas is a joint venture between Sony Pictures Animation and Aardman Animations, the British studio known for Wallace and Gromit. Cold, charmless Christmas movie radiates scarcely any tradition or warmth. I didn’t realize the classic tale of Santa Claus needed to be re-written for contemporary audiences but that’s what we’re presented with here. It’s about as captivating as a lump of coal. The story’s decidedly modern, revisionist history of Santa Claus is kind of icky. Santa travels around in a gleaming red space ship to drop off presents in high tech fashion. However, Santa wants to step down from his position (!) Apparently he is just the latest in a long line of Santas that pass from one generation to the next when the guy is ready to retire. Grand Santa, a cranky 136-year-old (!) is still around in fact. Santa has an older son – Steve, who looks like a bodybuilder and manages everything at mission control back at the North Pole. Steve thinks he’s the logical choice to replace father. Santa’s younger son – Arthur is a klutz that oversees the letter department. The elves joke what a loser he is (!) After failing to deliver one package, Steve maintains that Santa shouldn’t worry about the happiness of one child out of a billion (!) Although more taskmaster than evil, Steve is the closest thing to an antagonist in the film. Santa ultimately decides nothing can be done (!) so his son Arthur plans to rectify the situation. Arthur Christmas is an overly simplified tale aimed exclusively at very young children. When you get right down to it, the entire plot concerns the delivery of one package. That’s hardly a story to excite the senses. There’s plenty of colorful, eye popping visuals, however. It’s slick and frantically paced but very little of it engenders any sort of tenderness. All of the hyperactivity actually gave me a headache. Additionally the high caliber British cast (James McAvoy, Hugh Laurie, Jim Broadbent, Bill Nighy, Imelda Staunton) have been instructed to shout all of their lines as if that would makes their voice performances funnier. That doesn’t work in bad sitcoms and it doesn’t work here. It’s not all wretched. There’s a sexually ambiguous little elf named Bryony who is a peculiar gift-wrapping obsessive. She/He/It is kind of amusing. But as for the rest of it, I found this frantic exercise extremely lacking in Christmas spirit. It feels like several lifetimes since we last saw the once amiable stoner duo escape from Guantanamo Bay. Things are not the same these days. Set 6 years following the events of the last film, Harold and Kumar have drifted apart and are now estranged. Harold is married and adjusting to his new wife’s family. He’s replaced his best friend with Todd. Kumar also has a new buddy named Adrian. Harold and Kumar are just not as tight as they used to be. If that overwrought setup feels like it’s missing the joy of what made the original so winning, you’d be right. The story takes off after Kumar accidentally burns down Harold’s father-in-law’s treasured Christmas tree. The two are compelled to scour New York City for the perfect one to replace it. A Very Harold & Kumar 3D Christmas is an unfunny movie and surprisingly joyless for a story set during the holidays. For much of the picture the two once close friends don’t even like each other. They’re much different characters now. Harold has grown up and acts like a respectable adult and Kumar solely lives to just smoke weed. Both trajectories are disheartening for contrary reasons. Harold is a buzzkill and Kumar just seems mentally underdeveloped. Watching actor Kal Penn in his mid-30s still driven by an all consuming desire to just smoke pot and nothing more, is not convincing. Almost like he left his position as Associate Director of Public Engagement at the White House to make a comedy about marijuana. To be fair, this is a marked improvement over the execrable Escape from Guantanamo Bay which seems like a dated relic today. But A Very Harold & Kumar Christmas tries too hard to wallow in poor taste. The disrespectful humor is reminiscent of Bad Santa but nowhere near as trenchant. It’s soft not subversive, over-relying on moronic frat boy antics than scathing comedy. I will say the production does make good use of the 3D effects. There’s lots of scenes of flying glass shards and smoke that seemingly drifts out into the theater. There’s also a hilarious line when Harold, upon meeting his wife’s mother for the first time, mistakes her for someone else. I think there’s one more knee-slapper somewhere in there but I can‘t remember it anymore. I’ll give the stoner comedy 2 stars, one for each laugh. Hey they were pretty good laughs. Gorgeous adaptation of the Charles Dickens classic is a 3D feast for the eyes. This slavishly faithful interpretation, is highlighted by effects so extraordinary, there are moments where it literally looks as if snow is falling in the theater. As recounted here, the story really takes its time and exhibits a dark moodiness, especially in the early scenes. In other parts, there are nightmarish images that are rather jolting for a PG rated film. Consequently, the film will please adults much more than it will entertain young children. 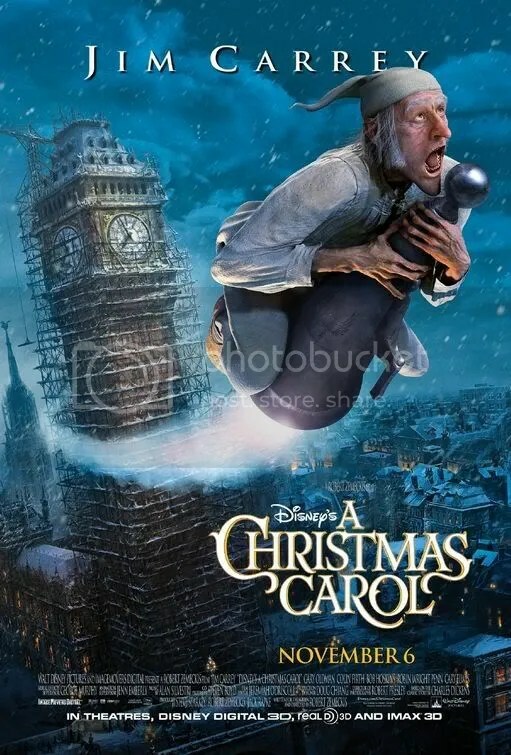 However, for those that are patient, this atmospheric version of the classic tale is an enjoyable holiday treat.